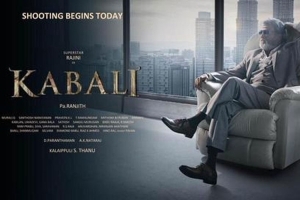 V. Creations’ Kabali (that has been dubbed from the Tamil film by the same name) is a story about a Malaysian don Kabaleeshwaran aka Kabali (Rajinikanth), the very man who belongs to an Indian origin. After spending 25 long years, he finally gets freedom. The very moment he is out of the jail, besides taking stock of the situations out there (in Malaysia), he also starts yearning for his wife (whom he considers dead, after being killed by his rivals). Besides being a do-good gangster, Kabali also runs a reform school by the name of ‘Free Life Foundation’, with the help of his closet aide Ameer (John Vijay). While Kabali was in jail, there cropped up a dreaded rival gang that operated under the name of ’43’, the very gang whose members will do anything for the sake of money. Amidst all this, Kabali also gets to know that, besides his wife being still alive, he also has a daughter, who happens to be a contract killer by profession. The irony of the situation is that Kabali’s very daughter gets paid to kill her own father! Will the daughter in her overtake her ‘killing instincts’ or will she surrender to her selfless father… who has been the messiah of many helpless people, will Kabali ever get to meet his family that consists of his dutiful wife and his daring darling daughter is what forms the rest of the story.